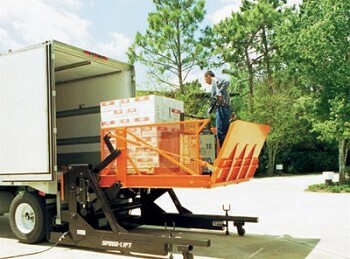 Speed-Lifts are the safe and highly productive way to move unit loads between truck or dock height and ground level. Flexibility of the basic parallelogram design coupled with numerous unique options puts Speed-Lifts to immediate work outside, inside, fixed in one spot, or mobile. As needs change, the Speed-Lift is ready to move easily to a better truck approach, a different door, or to perhaps an entirely new location. Flexibility to adapt to your precise present needs as well as being equipped to handle future needs means your Speed-Lift investment will continue providing excellent results for many years to come. In contrast, most scissor lifts lose up to 80 percent of their resale value the day they are installed in pits.